Founded in 1851, Albany Law School, located in the capital of New York, is the oldest independent law school in the nation. The law school was established when three accomplished lawyers revolutionized legal education after deciding that legal clerkship alone was insufficient to prepare lawyers for success. Since then, Albany Law School has produced a number of distinguished alumni, including two Unites States Supreme Court Justices, President William McKinley, and the first woman admitted to the New York bar. Of the more than 1,000 applicants in the 2016-2017 academic year, 147 were subsequently enrolled as first year law students. The school boast a student:faculty ratio of 11:1, providing law students with ample opportunity to connect with their professors and gain the knowledge and experience necessary to become effective lawyers. Leading Albany Law School is President and Dean Alicia Ouellette, herself an alumnus of Albany Law. The institution was founded on innovation in legal education, and Dean Ouellette has continued that tradition, leading Albany Law in the development and implementation of a new strategic plan and putting into place several new and creative programs for developing law students into lawyers. 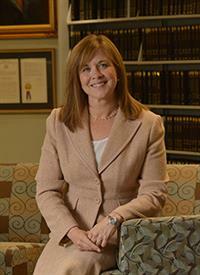 Thank you, Dean Ouellette, for participating in our law dean interview series. The law school experience is much like a cultural and language immersion program for native English speakers in a non-English speaking country. For the newest law students, obtaining fluency in the law -- reading it, understanding it, speaking it, applying it – is the biggest challenge. Some students adapt quickly, but for others it is a steep and difficult learning curve that challenges confidence and one’s prior understanding of oneself. Once fluent, law students face the challenge of meeting the many demands of today’s legal employers. Traditional and nontraditional legal employers expect students to graduate prepared for practice, which means our law students need to understand how to talk with and listen to clients, how to problem solve, how to handle a file, and so much more before they graduate. In other words, students are expected to learn more, and to put to work what they’ve learned, in a shorter time than ever before. At Albany Law School, we provide significant support – individual mentoring, professionalism training, and academic advising tailored to specific career paths – to prepare our students for this challenge. As I see it, the biggest challenge we face as a law school is ensuring we will continue to thrive in five to ten years. Meeting that challenge requires vision and courage on behalf of all constituencies – our faculty, staff, students, and alumni. As the leader of an organization that is constantly looking and moving forward, my biggest challenge is simultaneously honoring our past, inspiring excellence in the present, and moving toward a vibrant future -- while at the same time motivating the rest of the community to do the same. Change is hard, but change is critical for success in legal education today. Anything related to technology: cybersecurity, healthcare, big data, financial services, and intellectual property. Yes. When I was a student, most of the focus was on learning the law and legal analysis through use of the Socratic method. There was one grade given at the end of the course, some of which lasted the whole year. At Albany Law School today, the focus on what we teach – and how we do it -- is much broader. In addition to legal knowledge and analysis, we emphasize and measure core competencies for lawyers and leaders: problem solving, counselling, negotiating, strategic thinking, and communication. Our teaching methods vary from professor to professor, though our outcome goals are the same, and almost everyone incorporates problems, simulations, and even real client contact in their classrooms. There is continuous assessment and feedback through midterms, quizzes, assignments, and in-class feedback. Several of our doctrinal professors have incorporated practicums – so that students are developing real practical skills as they learn the subject areas. And of course, our outstanding clinic provides every student the opportunity to represent real clients at the side of an experienced faculty member. I’m not a criminal law expert, so I can only speculate, but I suspect that brain imagery, facial recognition software, and further advances in DNA technology will play a major role in the proof offered in criminal cases – both for the prosecution and the defense. Given how divided our nation is right now, I think the most important challenge facing our Supreme Court is maintaining integrity of the legal and judicial systems, the checks and balances of system of government, and respect for the rule of law. I spent most of my practicing years as an appellate attorney, and I do miss practice. I miss the quiet task of reviewing a record and crafting the best possible arguments for my client. I miss the back and forth of oral argument, and the rush of decision days. There is nothing like the direct impact of crafting an argument that becomes the opinion of the court. Legal scholarship can have the same impact, but those instances are far fewer and more indirect than arguing directly to an appellate court. My answer to this question would vary from day to day. Today, I’d welcome a lively conversation amongst strong women: Eleanor Roosevelt, Michelle Obama, and Elena Kagan. Even having read Go Set a Watchman, To Kill a Mockingbird is still my favorite. The scene where Gregory Peck/Atticus Finch delivers his closing argument is incredibly powerful. For more information on criminal defense visit the Law Offices of Adam R. Banner, P.C.